We all have that one person that dominates our social media feeds with perfectly filtered, duck-lipped selfies like they’re going out of style. And yes, it’s annoying (and a quick way to get unfollowed). In some cases of repeat offenders, it can be entirely narcissistic – in a “just a reminder of how beautiful I am” way. I won’t deny that. Selfies have also been called desperate cries for help from insecure girls with deep-seeded issues who need to seek validation through their looks. On the other hand, however, the selfie can actually be an entirely empowering thing for women. A recent paper by Derek Conrad Murray, a professor at University of California at Santa Cruz, suggests that selfies are actually positive because they are a powerful way for women to control how they’re perceived. 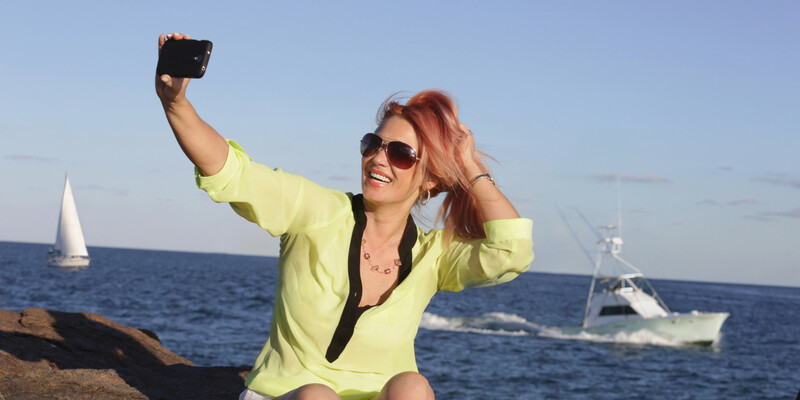 “Popularly regarded as a shallow expression of online narcissism, the selfie is both adored and reviled; yet it flourishes as one of the most effective outlets for self-definition,” states the abstract. And it’s true. Taking and posting a selfie offers a female complete control over a moment in time and how she is choosing to reveal herself. Selfies can show what she’s feeling, what she’s doing, and the parts of her personality she’s most comfortable with sharing. The selfie is also a way for a woman to acknowledge her unique beauty. When so many women have “I hate my body, nose, or hair” minutes on the regular, selfies offer a way for a female to proudly celebrate her beauty (whatever that may look like) when she feels good about herself. The other day, a female who I know has struggled with body issues posted a selfie on social media stating that she was still in bed, but that the light was too good not to take a selfie. And why the hell not? Amazing lighting doesn’t happen all the time. Another friend who had been going through a rough time got her hair done for the first time in ages and posted a gorgeous, confident-looking shot of herself that was met with over 100 “likes” and comments, all of which I’m sure made her smile through her sadness. Most of the time (when done for the right reasons, as opposed to shameless self-promotion guised as doing good) the #nomakeupselfie movement juxtaposed the narcissism and self-absorption associated with the idea of the selfie. The movement was designed to both highlight the natural beauty of a female and to raise money and awareness for important causes, like cancer. In similar vain, the Internet went wild with praise after Lorde posted a selfie in bed with her hair in a bun, zero makeup, and her face dotted with acne cream. Many women use selfies to reveal real, untouched sides of them. The #365feministselfieproject encourages females to post a selfie every single day for a year, regardless of their appearance. Some females even post shots making ugly and funny faces on the regular. Full-body selfies have also been used as a powerful tool to promote positive body image and varying notions of beauty as it related to body shape. For example, one woman’s selfie in an Old Navy change room went viral in its promotion of self-love and body positivity. Lane Bryant’s powerful #imnoangel campaign also inspired women of all sizes to share full-body mirror selfies in all their “flawed” glory in a backlash against the typical Victoria Secret catwalk frame. Let’s not forget about the #feministselfie movement, which celebrates fierce, confident women worldwide. The hashtag reveals a stream of women of all appearances from all types of professional backgrounds, engaged in an array of activities. This past summer, we also saw thousands of female engineers take to Twitter and Instagram with the #iLookLikeAnEngineer hashtag and accompanying descriptions of what they do to dispel the myth that all engineers are men. Female empowerment isn’t the only cause the selfie serves to promote. During Tumblr’s “Blackouts,” black users posted selfies on the site in order to celebrate and support black lives and to inspire dialogue on the lack of representation of African Americans in the media. That’s just one example. Of course, for many people, the concept of a selfie still conjures images of obnoxious self-absorbed sorority girls (remember the backlash these girls received? ), and that probably won’t change anytime soon. But before you go rolling your eyes about the concept of the selfie, keep in mind that it’s been used as a tool for major social change. And that’s not going to change anytime either.